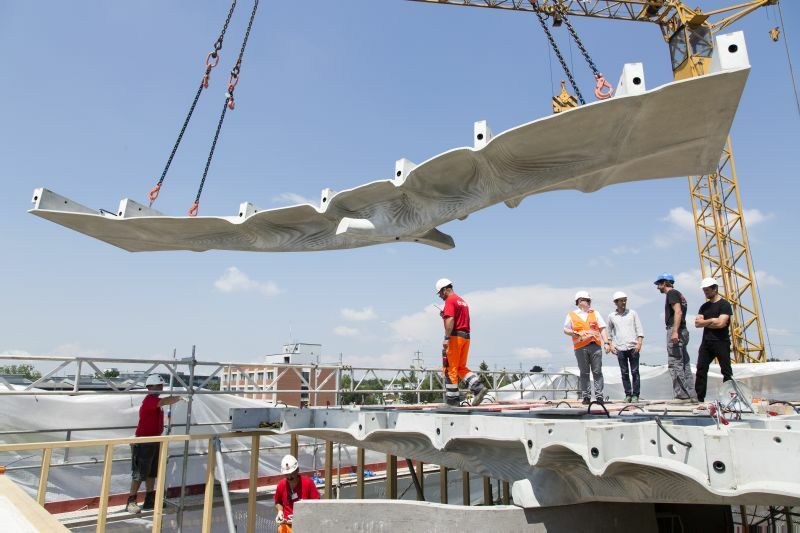 As part of the Swiss National Centre of Competence in Research (NCCR) interdisciplinary research project, researchers from eight ETH Zürich professorships have fabricated an almost 80m² lightweight concrete slab using 3D sand printing for its formwork. 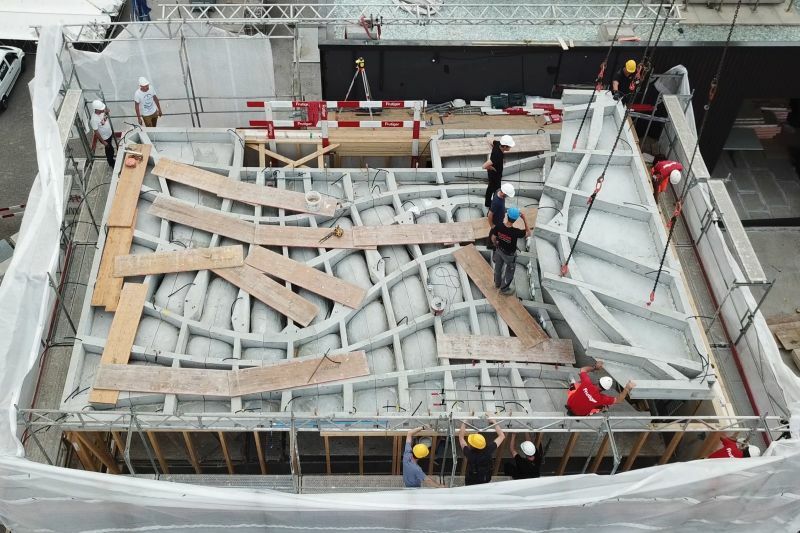 The slab is one of the core elements in the NCCR’s DFAB House, a digital fabrication building project that explores and tests how digital fabrication can change design and construction. 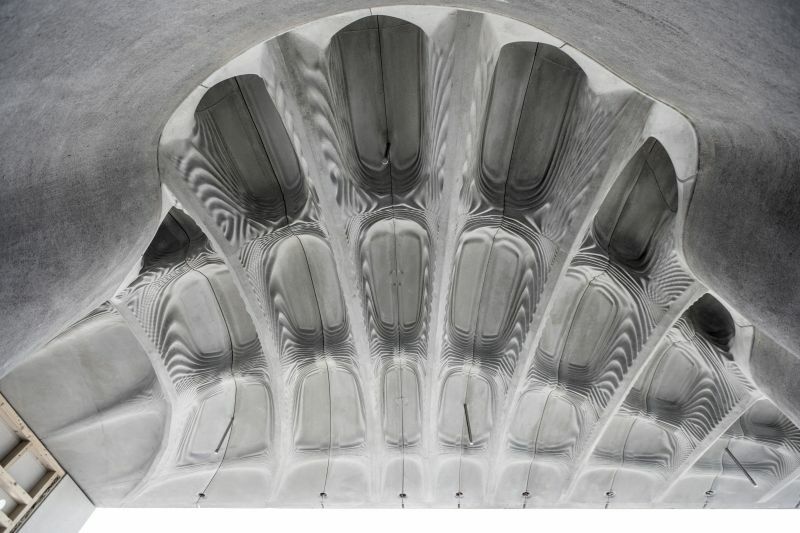 Coined the “Smart Slab”, it combines the structural strength of concrete with the design freedom of 3D printing. Just 20mm thick at its thinnest point, decoratively ribbed and not even half as heavy as a conventional concrete ceiling, the slab consists of eleven prefabricated concrete segments, each 7,4m long and joined using post-tensioning cables, and connects the lower floor with the two-storey timber volume above. The Smart Slab ceiling cantilevers up to 4,5m in multiple directions over a curved, S-shaped mesh mould wall. 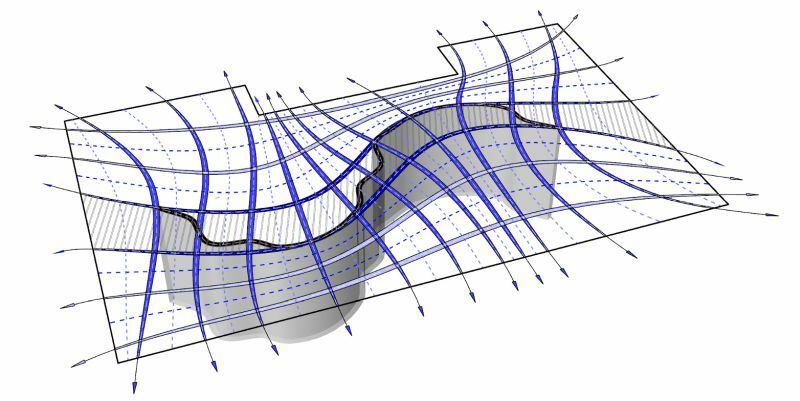 Structurally optimised, the material is distributed in a hierarchical grid of curved ribs, which vary between 30 and 60cm in depth. The 1,5cm thick concrete fields between these ribs are domed to maximise stability and to minimise the amount of material needed. Consequently the slab only weighs 15 tons, almost 70% less in comparison to a conventional solid concrete slab. Details for the facade interface and for technical installations such as sprinklers and lighting are embedded into the prefabricated elements to reduce construction height and to avoid complexity on the construction site. Why a 3D printed mould? While printing entire houses layer by layer is not completely new, for the Smart Slab project, the researchers did not produce the building components through 3D printing, but rather the formwork. To achieve this, they used a large-scale 3D sand printer, which means the resulting moulds consist of a kind of artificial sandstone. 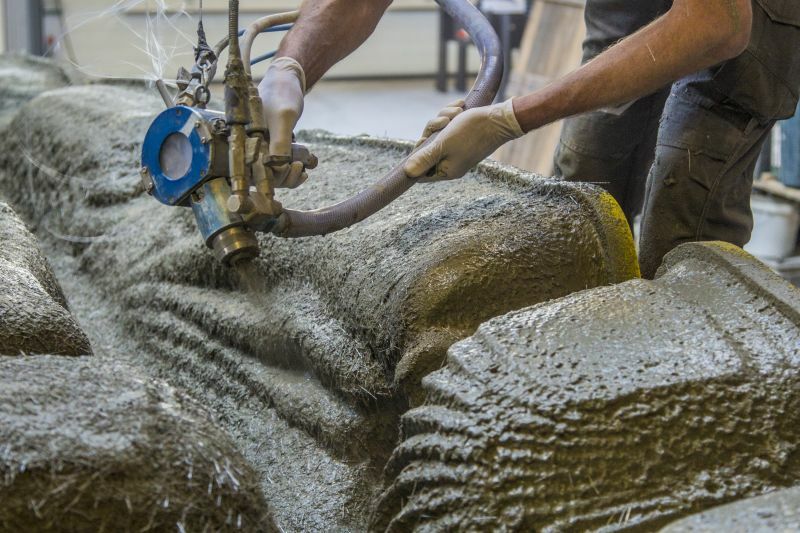 One of the advantages over the layered concrete printing process is that high-performance, fibre-reinforced concrete can be used and the structure can be fabricated in the precision of millimetres. In addition, formwork production is the most labour-intensive step in concrete construction, particularly for non-standardised components. Since concrete is relatively cheap and abundant, the temptation is to produce the same solid ceilings over and over again, but the disadvantage is excessive material consumption and implicitly, a big carbon footprint. With digital fabrication methods components can be optimised, enabling the necessary stability with far less material. The geometric complexity of a component does not matter in 3D printing, nor does it cause any additional costs – the printer simply prints what it is told to. Planning software was developed to integrate the fabrication parameters into the early design phase and allows for optimisation of the slab design, automatic detailing, cost control and the direct export of fabrication data relating to the formwork. 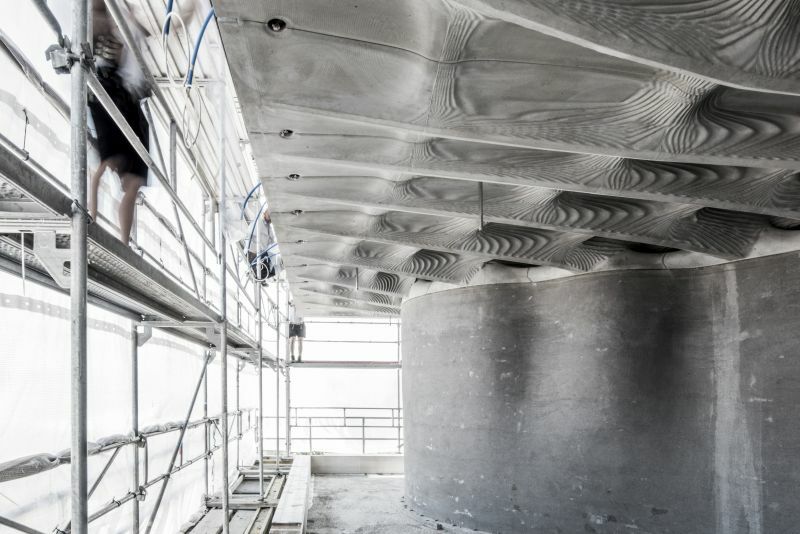 For production, in addition to basic data such as room dimensions, the researchers also entered a scan of the curved wall, accurate down to the last millimetre, which acts as the main support for the concrete ceiling. With the software, one could adapt the geometry of the slab so that at each point it was applied only as thick as structurally necessary to support the force flow. When looking at the ceiling from below, one sees an organic ornamental structure with different hierarchies. The main ribs carry the loads, while the smaller filigree ribs are mainly used for architectural expression and acoustics. Statics and ornamentation go hand-in-hand. The lighting and sprinkler systems are also integrated into the slab structure. Their size and position were similarly coordinated with the planning software. In this way, the building technology disappears elegantly into the slab to occupy very little space. This saves only a few centimetres in the DFAB House project, but in high-rises this may mean that a few extra floors could be fitted into the same height. After planning on the computer is completed, the fabrication data can then be exported to the machines. This is where several industry partners came into play: One produced the high-resolution, 3D-printed sand formworks, which were divided into pallet-sized sections for printing and transport reasons, while another fabricated the timber formwork by means of CNC laser cutting. The latter gave shape to the upper part of the Smart Slab and left hollow areas that reduce material and weight, and at the same time create space for electrical cables. The two types of formwork were then brought together by a third company, which first sprayed the fibre-reinforced concrete onto the sand formwork to produce the finely ribbed surface of the lower concrete shell and then casted the remaining concrete into the timber formwork. After a two-week hardening process, the eleven individual concrete segments were ready for transport to the site. A crane hoisted the concrete elements onto the loadbearing wall, where the prestressing took place. Workers pulled steel cables lengthwise and crosswise through the concrete support and into the channels already inserted in the formwork. Tensioning the cables massively increases the system’s load capacity. Full thanks and acknowledgement are given to NCCR Digital Fabrication and ETH Zürich for the information given to write this article. Main image: The hierarchical grid of structural ribs of the Smart Slab.